Defense Secretary Jim Mattis visited troops deployed to the U.S.-Mexico border Wednesday and offered the most insights to date into his thinking about the deployment and what to expect next. In interviews with reporters traveling with him and during an on-the-ground visit to Camp Donna near McAllen, Texas, with Department of Homeland Security Secretary Kirstjen Nielsen, Mattis talked about the mission’s sensitivities, namely that the forces are deployed on U.S. soil, and how that has changed a few of the ways they operate. 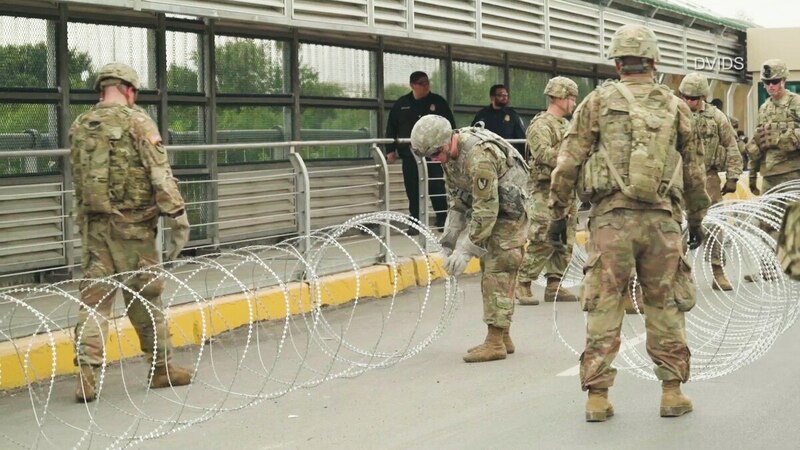 It’s been two weeks since the formerly named Operation Faithful Patriot launched, and since then the mission has come under scrutiny for its timing, sending thousands of troops to emphasize border security immediately before a national election; its costs, which are still not public; and its use of active duty troops over National Guard forces, who have been used by the three previous administrations during border immigration surges. Mattis downplayed the use of active duty over Guard forces, too — by citing the 1916 deployment of the U.S. Army to capture Mexican revolutionary Pancho Villa, after his forces invaded the U.S. and captured Columbus, New Mexico. “There’s nothing new under the sun,” Mattis said. “President Wilson a little over 100 years ago deployed the U.S. Army to the southwest border — the threat then was Pancho Villa’s troops,” Mattis said. Forces will stay longer than that, though, through at least the holidays. When pressed about troops spending the holidays away, Mattis pushed back, noting there are forces all around the globe who won’t be home, either. “Welcome to your military, it’s on duty,” he said. Ultimately, as many as 7,000 may be sent to secure the border as a caravan of thousands of migrant men, women and children make their way through Mexico toward the U.S., Mattis said. Later in the visit, as he walked the camp with Nielsen, he told the Homeland Security chief, “I think there’s some additional requests coming,” in respect to additional concertina wire to create a more bolstered barrier against any mass numbers of migrants who attempt to cross into the U.S. Hundreds of migrants have arrived in the border city of Tijuana, The Associated Press reported. U.S. authorities were struggling to deal with a group of 357 migrants who arrived aboard nine buses Tuesday and another group of 398 that arrived Wednesday. On Tuesday, a couple of dozen migrants scaled the steel border fence to celebrate their arrival, chanting “Yes, we could!” and one man dropped over to the U.S. side briefly as border agents watched from a distance, AP reported. He ran quickly back to the fence.